As our world expands due to information and technology, kids benefit from learning about other cultures and societies. 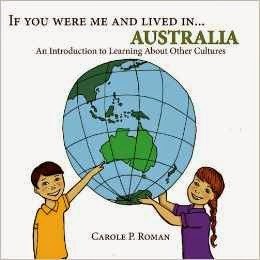 In the new book, If You Were Me and Lived in Australia, author Carole P. Roman brings the world of Australia to school age children. Written for children ages 3 to 8 years old, this book shares the sights, sounds and life of Australia in a way that children can relate to without talking down to them. The book is easy to read for younger readers or can be read aloud for beginning readers. The pictures are engaging and spark a child's imagination. The topics of the book are easy for the kids to understand. From what kids eat a lunch to playing sports, the books shares similar activities that all kids do. While American school children may eat PB&J sandwiches, Australian kids might eat a Vegemite sandwich. This book helps everyone to understand that all cultures are similar but might call items by different names. “This series is just enough facts to begin a discussion without overwhelming the child and can be expanded or contracted to fit the age group,” Roman explains. It would make a great addition to a classroom library or a home collection. I would recommend this book for families that are thinking of traveling abroad with their children. It is an easy way to explain a different culture without becoming over-whelming. I look forward to additional books written in this matter. If You Were Me and Lived in Australia by Carole P. Roman can be purchased on Amazon. Would you like to add this book to your library? Please use the Rafflecopter to ener.